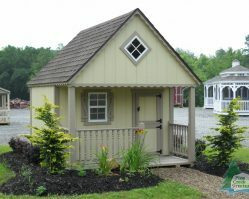 Each kids play house is built with the same quality as all of the other products at Salem Structures. 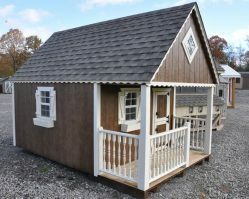 Most designs are scaled down versions of our Cabins or storage shed models. 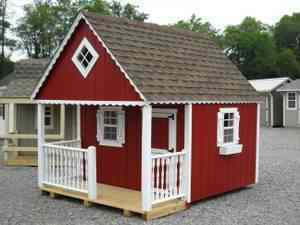 This allows you to coordinate your property theme with matching styles and colors for all structures in your yard. 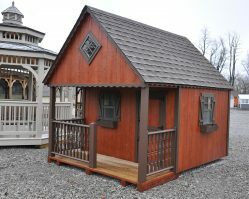 Most playhouse designs have a loft area with a ladder to give the kids a place to store their toys, or just “hide out”. They can have windows that open and a porch complete with a railing to give them that “all-grown-up” feel while playing in their new house. 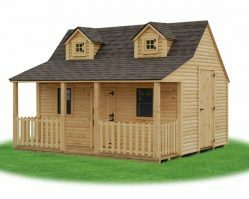 Completely assembled and delivered to your backyard for the price shown on the website.